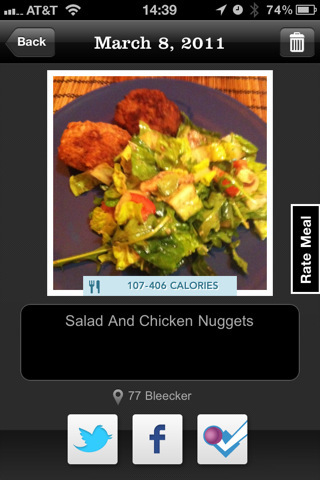 Meal Snap is a new iPhone app that magically retrieves calorie information from photos of foods you take. It’s basically like a Shazam app for foods. You snap a picture of any food item, and the app sends it off to its servers for identification. After a few minutes, you get back a notification that has identified your food by name and the number of calories it contains. The app keeps a timeline style history of your identified meal photos for your reference. You might be wondering how Daily Burn, the creator of the Meal Snap app does this? It appears that they are using human intelligence workers (probably the Amazon Turk system) to identify the food products and calories. Amazon Turk pays workers pennies per task performed, in this case identifying the food name and calorie count. It takes about 2-10 minutes to get a result back for any food. You will hear a little kitchen timer sound as results come in. The accuracy of the results can be rated by you to give feedback. You can rate the accuracy of the caption and the calorie range by choosing either Awful, OK, or Spot On! from the list. In my case the captions are pretty much accurate most of the time. There are some funny captions and some generic ones as well. The calorie range however is in the “awful” category most of the time. The app gives you wide range for the calorie count. This seems a bit too safe and can skew your total count. Also the calories are always understated. I’ve tested out packaged foods and all have come back with lower calorie counts than what is printed on the wrapping. What’s more is that you can not edit the calorie count yourself, which would be very useful. You can however edit the caption, and zoom in on the picture. Another cool feature in the app is that depending on when you take the picture, it tries to automatically classify your meal. For example if you take a picture in the early afternoon, Meal Snap will pick “Afternoon Snack” as its category. You can always go in and edit these yourself. For each day you see a total estimated calorie count, as a summation of all your meal pictures. You can jump to any previous day using a timeline on the left side of the screen. Overall, Meal Snap is a really great idea, though it needs work. Waiting for the results to come back is acceptable, although getting back inaccurate results is not. For now it is a nice way to journal photos of your meals, and if they let us change the calorie counts ourselves, that might make it more useful as well. 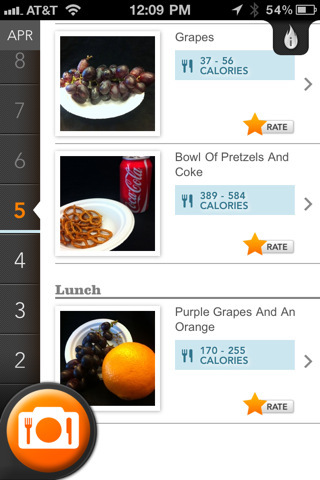 AppSafari review of Meal Snap – Calorie Counting Magic was written by Joe Seifi on April 20th, 2011 and categorized under App Store, Food, Photos. Page viewed 4955 times, 4 so far today. Need help on using these apps? Please read the Help Page.